The Mechanistic-Empirical Pavement Design Guide (M-E PDG) represents a major change from the way pavement design has been done in the past. The designer first considers site and construction conditions in proposing a trial design for a new pavement or rehabilitation. The trial design is then evaluated for adequacy through the prediction of key distresses and roughness. If the design does not meet desired performance criteria, it is revised and the evaluation process is repeated as necessary. Thus, the designer has the flexibility to consider different design features and materials for the prevailing site conditions. As such, the M-E PDG is not a design tool but a very powerful and comprehensive pavement analysis tool. The M-E PDG as provided by the Transportation Research Board’s National Cooperative Highway Research Program was calibrated nationally by taking into consideration the various climatic regions across the country. If calibration coefficients are used for pavement design in Texas, the design could be either an over-estimate or an under-estimate for another region or State because materials, environmental conditions, and construction practices in Texas differ from the national average. The same will apply to any other State. Dr. Jorge A. Prozzi, Associate Professor of Civil Engineering at the University of Texas at Austin, and his research team conducted a study with the objective of calibrating the asphalt concrete (AC) rutting model predicted with the current M-E PDG to actual infield performance of pavement sections in Texas. The study focused on finding two bias correction factors (Levels 2 and 3) for the AC rutting transfer function, per region, that are consistent with intermediate/ regional level designs. The data used in the calibration process were taken from the Inventory, Monitoring, and Traffic modules of the LTPP database. The pavement sections included as part of this study are from the Specific Pavement Study (SPS) experiments; SPS-1 and -3. The SPS-1 experiment examines the effects of climatic region, subgrade soil, and traffic rate on pavement sections incorporating different levels of structural factors. These factors include drainage, AC surface thickness, base type, and base thickness. The SPS-3 experiment compares the effectiveness and mechanisms by which the selected maintenance treatments preserve and extend pavement service life, safety, and ride quality. The study factors for flexible pavements include climatic zone, subgrade type, traffic loading, initial condition, and structural adequacy. The regional calibration factors were obtained by minimizing the sum of squared errors between observed and predicted surface rutting. In this case, a simultaneous joint optimization routine was used because it is theoretically sound. Finally, an average of the regional calibration coefficients for AC and subgrade rutting was computed to obtain the set of state-default calibration coefficients for Texas. 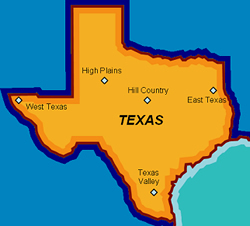 performance model in the M-E PDG for five different regions in Texas, and for Texas in general, will be available at the end of 2008. For more information about the Texas experience, contact Dr. Prozzi at prozzi@mail.utexas.edu; or to let LTPP know how your State is using LTPP data, contact Deborah Walker at deborah.walker@dot.gov. 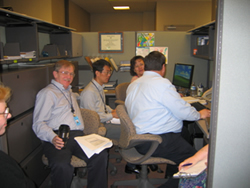 This spring, the LTPP program successfully completed the transfer of the LTPP Information Management System (IMS) server from the Technical Support Services Contractor (TSSC) in Oak Ridge, Tennessee, to the new LTPP Information Center at the Turner-Fairbank Highway Research Center in McLean, Virginia. Everything went smoothly, and the TSSC staff did a great job of setting up the system and training LTPP Team members on basic Oracle database operations. The LTPP Database Network, which will ultimately include multiple Oracle servers, workstations, and supporting storage systems for the entire LTPP IMS, including the Pavement Performance Database, the Central Traffic Database, and the Ancillary Information Management System. The LTPP Customer Support Service Center (CSSC), which provides a single point of contact and technical assistance for the world’s largest pavement performance database. 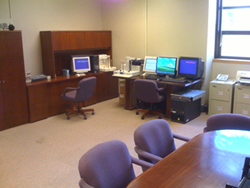 Since 1997, the CSSC has received more than 5,000 requests for data and information, as of January 31, 2008. The LTPP Reference Library which contains documentation on experimental planning, data collection guidelines, testing procedures, data processing and storage, as well as research reports, construction and installation reports, and products and their supporting documentation. To learn more about the LTPP program and products, visit www.fhwa.dot.gov/pavement/ltpp/index.cfm or contact the LTPP CSSC by phone at (202) 493-3035 or email ltppinfo@fhwa.dot.gov. The LTPP forensic studies announced in the last LTPP Newsletter Spring 2008 are complete for test sections at two sites: the New York SPS-8 and the Ohio SPS-1. Studies are planned at two other sites: the Arizona SPS-5 and the Texas SPS-5. The test sections are hot-mix asphalt surfaced pavements that exhibit cracking and some rutting. Information on the results of these studies will be coming soon. For more information about the ongoing LTPP forensic project, contact Jack Springer by phone at (202) 493-3144 or email jack.springer@dot.gov.